Apple has named Darlington an Apple Distinguished School for 2018–2021, recognizing the school for its commitment to teaching students technology skills to solve real-world problems as an integrated part of its curriculum. “We are thrilled to receive this honor again, for the next three years, and to share this accomplishment with our wonderful teachers and students. It is only possible because of the great work they are doing,” said Beth Wardlaw, technology integration coordinator. 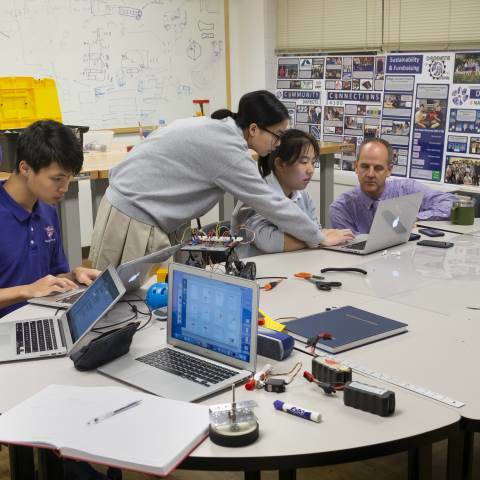 “The process of becoming an Apple Distinguished School has become much more rigorous as Apple looks beyond just the software and hardware, but how our school is using technology in an innovative and creative way. For our renewal, we were able to share what our students and teachers are doing on a daily basis.